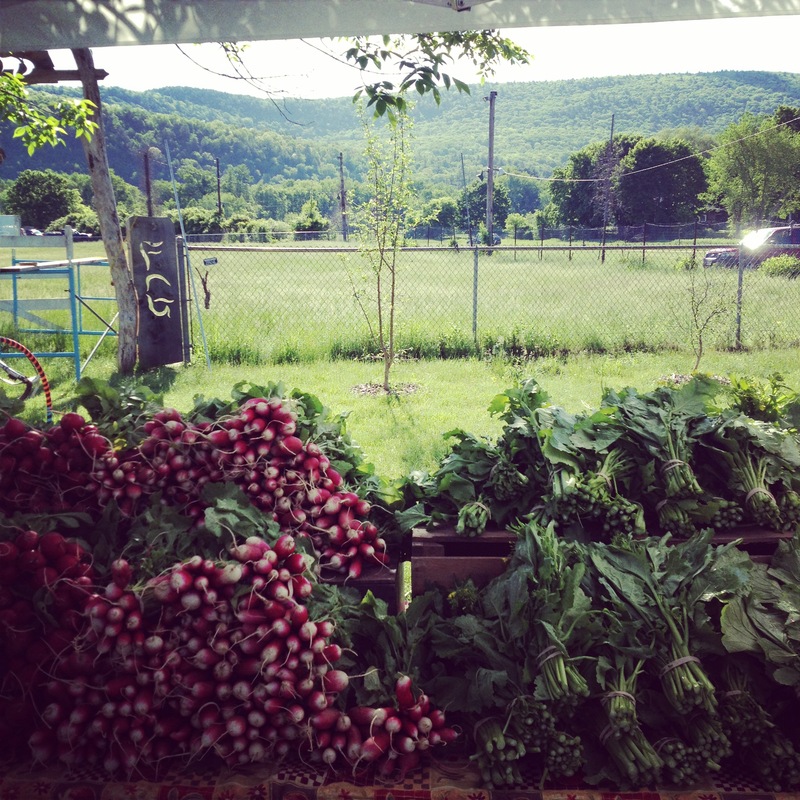 We’re a few weeks into our farmers’ market season here in the Berkshires. We’re in a new location this year, which is a huge deal because the market had packed into the parking lot of the old train station behind town hall for almost 3 decades. This year, we’re at the Great Barrington Fairground, a place which both as a cause and a location is very close to my heart. The fairgrounds housed an actual fair through my whole childhood, and every September, I remember going to see the apple pies and the gargantuan pumpkins and my favorite, the demolition derby. In 1995, a tornado hit our town, taking out buildings here and there wherever it felt like it. The tornado ripped through the fairgrounds, and although there was some rebuilding after that, the property ended up getting stuck in the hands of people from far away who didn’t care about it. Finally last year, friends of mine got the money and energy together to buy it and in the hopes of returning it to the community. I couldn’t be happier, and I love being there at the market with the mountain behind me, standing in the place which for so long now has been empty save for teenagers looking for hidden places. The ground itself seems to be glad to have us. I’ve found, mostly through my brief-ish stint in local politics, that New Englanders on the whole are resistant to change. The most common question I’ve heard at the market this year is “How do you like the new digs?” and sometimes I can tell they like it and hope I like it too, but other times the question seems to come from a place of hoping I’ll say I don’t like it, so that we can commiserate together about how everything should stay the same forever and ever. I feel like a New Englander through and through, but I was born in California, and maybe this explains why I love change. I’d shift the furniture my house every day if I had nothing else to do. That’s one of the reasons I made an impatient politician. I work at the Great Barrington farmers’ market on most Saturdays for Indian Line farm. This is part of my story, and although Elizabeth (the farmer, and my friend, who I work for) and I can’t seem to remember what year I started working at the market, my best guess would be 2007, and that makes this my eighth year. I started out as a working member of the CSA, and then I loved working at the market so much I took it on as a real job. It was talking about vegetables that got me started writing recipes in the first place, and writing here. My favorite way to cook broccoli raab is to roughly chop an entire bunch, leaving out the last inch or two of stem. If there are flowers in the bunch, even better. But the whole thing in a wide saucepan with an inch of water and a knob of butter. Bring it up to a boil, lower the heat, and cover the pan. Cook, stirring occasionally, until the broccoli raab is tender and deep green, 3 to 4 minutes. Toss the raab in the buttery water, drain off any excess liquid, and sprinkle crunchy salt and red pepper flakes over the whole pan. I love the suggested questions and will certainly use them! Thanks! LOVE talking food with the farmers at my market. They know their produce intimately and I learn so much from them. I can see that a job at a farmer’s market would be deeply rewarding. We have several farmer’s markets in area, and I’m lucky enough to live near the one which is open/sets up only in the afternoons! You’re lucky, Julie- afternoon markets are rare! But so good for people who can stop by on their way from work. Add garlic, Joan! Add it to every single thing. I support you. Not, of course, in that order. We have a fantastic farmer’s market on Sunday’s from 10-3 in Saratoga Springs. It’s located in front of the Lincoln Baths on Rt 9. It just started up last year but took off immediately. Folks are friendly, lots of parking and activities for the kids.